Did you know that Concord Hospital is home to the largest clinical research unit for blood cancer in NSW? 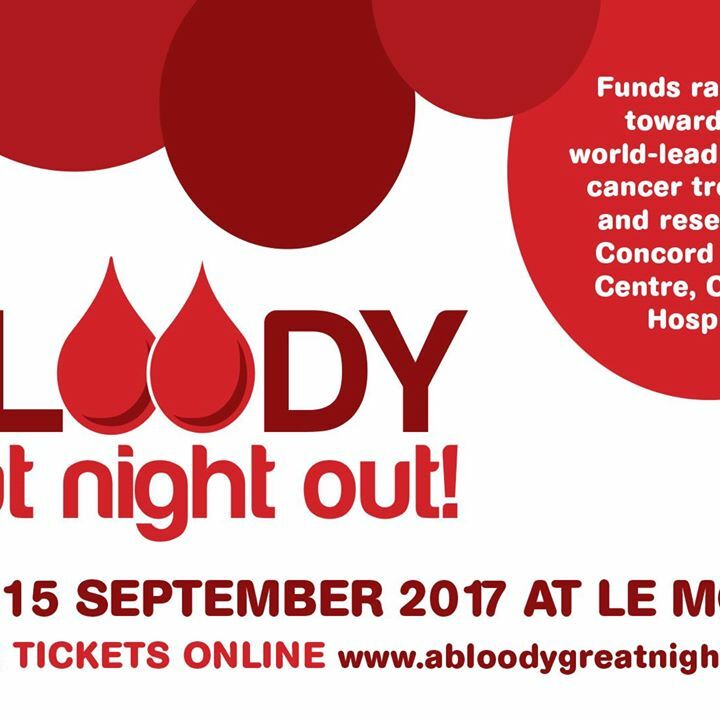 Their community fundraising event ‘A Bloody Great Night Out!’ raises much-needed funds to support their world-leading treatment and research. Join us on Friday 15 September at Le Montage and help give patients hope. The 2017 target is $160,000 to fund two additional clinical research nurses, so that more patients with life threatening blood cancers can participate in this research and access innovative treatments that would normally cost millions. Book your tickets now! You can also support this cause by purchasing raffle tickets online – there are more than $10,000 worth of prizes including two tickets to Europe. Please Share this Event with your friends and help us spread the word! The Bloody Great Committee invites you to join us for a fabulous night of music, dancing, fun and fundraising. Enjoy an exquisite four-course meal, beverages and entertainment at Le Montage, in the stunning Sarah Grand Ballroom, with expansive water views. Be part of the great community vibe at this popular event, which has earned its reputation for giving guests ‘A Bloody Great Night Out’. Glam up in your finest cocktail gown/lounge suit – and wear ‘a splash of red’ to show your support for our cause. All funds raised will go towards the life-saving work at the world-leading Haematology Clinical Research Unit at Concord Cancer Centre, Concord Hospital. Your support will help patients with life-threatening blood cancers, such as Leukaemia, Lymphoma and Myeloma, participate in clinical trials and access millions of dollars worth of new and innovative medicines, long before they are publicly funded. These treatments increase survival and provide a better quality of life for patients with blood cancers. For some patients, participating in these clinical trials is their only hope for a cure. Help us reach our current fundraising target of $160,000 to fund two new clinical research nurses to support blood cancer patients participating in our clinical trials. Tickets: $160 each ($50 from each ticket purchased can be claimed as a tax deductible donation).